In the narration The Chinaman of Pain by Peter Handke, the narrator states: He is the threshold. 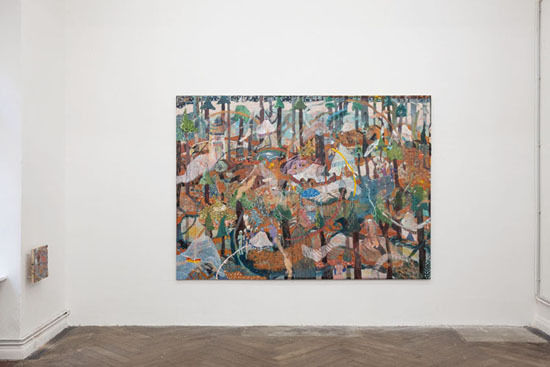 Looking at the works of the exhibition History Boy by Tom Anholt, one is instinctively inclined to establish a connection between this thought and the British artist. His works revolve around a potential transition. Clearly, Anholt refuses rigidity and foregone conclusions. 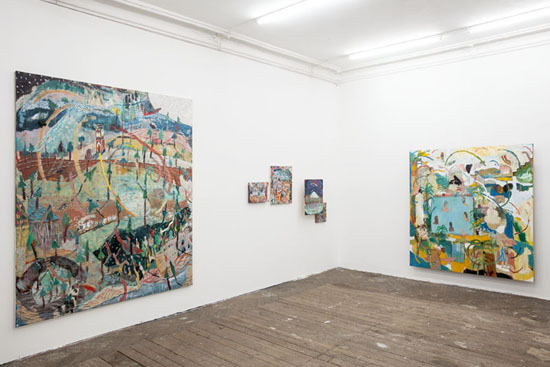 His paintings can be seen as openings or intermediate spaces. They balance on the verge between the concrete and the abstract. He who carefully observes the paintings, will notice traces of their emergence. Almost always they were repainted several times or their format was changed by adding or removing canvas. Thereby, all these works have something in common. By revealing their own process of origination they tell a story: The story, History. One facet of this story constitutes Anholt's family. His father, a much translated children's author and illustrator, has family roots that go back to Persia of the late Middle Ages. In the 16th century, the first known ancestor of the Anholts, Jacob Sjoesjan, led his maltreated Jewish family through deserts and across mountains while they were heading to Europe on similar routes to the ones of today's refugees. Presumably he wouldn't have managed to save anything of material value during their escape, but he doubtlessly brought permanent memories of the shapes and colours of his homeland. A couple of centuries later, Anholt tries to trace the tracks of those memories in his own psyche, at the point where it reaches into the collective unconscious mind. Of course he draws his inspiration from actual pictures from the Orient, nonetheless he doesn't seek historical accuracy. 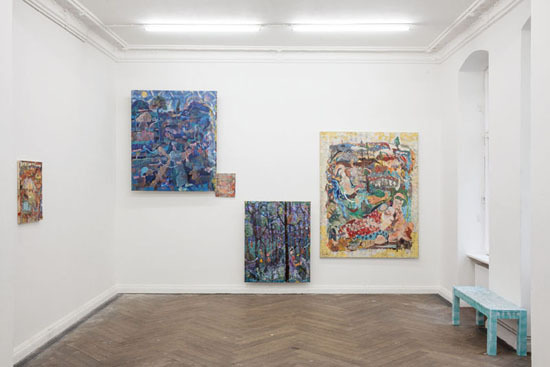 Working on his new paintings, Anholt is out to understand the cultural boundaries in the depths of his identity, to find out what is hidden inside of him and to gradually make it visible through patiently battllng with the canvas (or on wooden panels of the smaller formats). He delves into the distant past of his family. In the course of this, paintings with mystical titles come to light, titles which nonetheless evoke a concrete story, for instance The Mushroom Collectors, The Migration or King's Rock. Exuberant oriental paintings with a graspable narration that is always on the verge of fainting into pure abstraction due to the teeming crowd of abstract elements. On every painting one can find mysterious curves that seem to illustrate an otherwise invisible energy flow or small, luminous dots, which appear like star dust right out of a fairy tale. Undoubtedly, these works can be located in an intermediate reality. They have the ability to put you in a certain state, that one finds himself in right after waking up, when the consciousness immerses into the so-called real reality. Whereas the visions of our dreams, which have a different reality, dissolve so relentlessly, causing a certain melancholy. But different from such visions and dreams, Anholts paintings don't dissolve. They endure and allow an experience, which may be at first glance unremarkable, but fully transport the viewer to the artist's world. It equals the crossing of one of those minor thresholds that life provides us with, that Peter Handke described the following way: "Threshold in a year: spitting out cherry stones for the first time (May 30th, Brazzano)".